The BDS1200 connection head is the standard sample cell for the low frequency range from DC to 10 MHz including a Pt100 temperature sensor. The temperature range is from −200 °C to 400 °C. The cell is connected by four or two wire BNC cables to any kind of impedance analyzer. It is the recommended cell for the Alpha-N analyzer and is compatible with our Quatro, Novocool, and Novotherm temperature control systems. The sample material is prepared between two parallel electrodes as a sandwich capacitor. Cylindrical gold plated electrodes are available with 10/20/30/40 mm diameter. 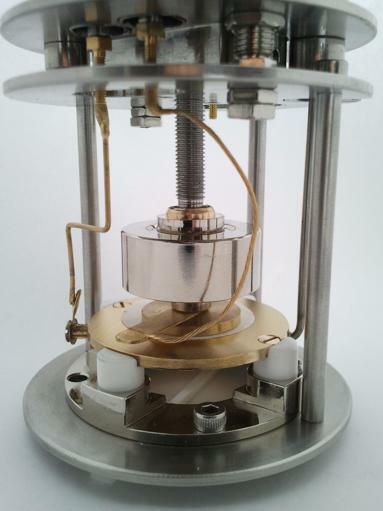 After preparation, the sandwich capacitor is mounted between the electrodes of the BDS1200 sample cell. An active BDS 1200 version avoiding cable effects can be found here.